University of Missouri College of Veterinary Medicine alumnus Bruce Whittle, DVM ’94, has been named a recipient of a 2018 Faculty-Alumni Award. The Mizzou Alumni Association selects the recipients of the award, which began in 1968 to recognize the achievements of faculty and alumni. The award focuses attention on individuals and their accomplishments, and on the relationship between faculty and alumni in promoting the best interests of the university. Through the awards program, the Mizzou Alumni Association expresses its appreciation for recipients and their service to higher education. Whittle was among six alumni winners this year. CVM Dean Carolyn J. Henry nominated Whittle for the award. He previously received both the 2017 CVM Alumnus of the Year Award and the Dean’s Impact Award, which is presented for sustained and significant positive impact on CVM programs. Whittle attended Northeast Missouri State University in Kirksville for three years before being accepted at the CVM. Following graduation, he and his wife relocated to Trenton, Missouri, where they established Honey Creek Veterinary Hospital, a mixed animal veterinary practice. His volunteer work includes donating his time to his alma mater to teach five days of dental labs for veterinary students at the CVM each year. He also mentors future veterinarians by providing externship opportunities at his practice to CVM students seeking hands-on experience in veterinary medicine. He helps to organize and execute the American Association of Equine Practitioners (AAEP) short course in dentistry for veterinary students. He also regularly shares his expertise through presentations at professional conferences and other continuing education forums. 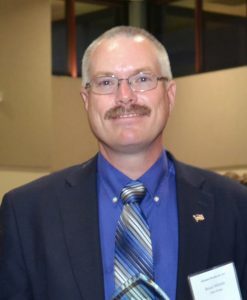 Whittle is a member of the American Veterinary Medical Association and the Missouri Veterinary Medical Association (MVMA), which he has served as vice president, president-elect, president, and board chair. He has also been a member and chair of the MVMA equine committee and a member and chair of the legislative committee. He is a member of the AAEP and has served on the AAEP equine dentistry committee, the scope of practice task force, the welfare and public policy advisory council as a member and vice chair, and the state legislative issues subcommittee as chair. He also is a member of the American Veterinary Dental Society, the Foundation for Veterinary Dentistry, the Missouri Academy of Veterinary Practice and the MVMA Academy, which he serves as vice president.